The Final Test - A Biography of James Ball Naylor, is about one of the most well known men in the country at the turn of the twentieth century, who has since faded into obscurity. A country doctor exceptionally gifted with natural ability, Naylor's passion for writing led to his greatest success as the author of a 1901 best seller. He wrote poetry, short stories, historical and other novels, and became well known as an entertainer and speaker on the Lyceum and Chautauqua Circuits, as well as a political force both as a candidate and a newspaper columnist. His contributions and accomplishment as an educator, writer, poet, public speaker, entertainer, public servant, and politician were numerous. His involvement in politics brought him more than passing friendships with local and national politicians, including Warren G. Harding, whom he knew from their earliest days in politics. This association led to Naylor's thirteen-year stint as a columnist for the Marion Star, but his staunch support of Harding in the face of the scandals after Harding's death affected Naylor's reputation as well. This is an inspiring story of a remarkable man with strong moral character and integrity who was dedicated to his family and to helping others in his profession as a physician. 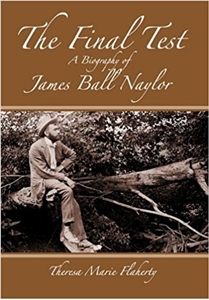 The Final Test – A Biography of James Ball Naylor was a FINALIST in the Biography-Historical category in the 2011 National INDIE Excellence Awards.